I am INSANE about skin protection and wear SPF 50 year round and 110 during the sunny months. I wear it alone and with my makeup as well. Most days I don’t wear makeup, but when I do I have perfected a routine that allows me to protect my skin, wear a full face of makeup AND reapply SPF throughout the day if necessary. The key to ultimate sun protection is to apply SPF under and over your makeup! YES this is easy and possible, I will list my routine below with product links. *Let this also be a reminder that the SUN IS ENEMY #1 when it comes to your skin aging, the sun “cooks” your skin- it’s as simple as that. Even in small doses, it adds up. Be mindful when you’re in the sun and get into an SPF routine NOW if you haven’t already and buy some cute hats & sunglasses while you’re at it. Protect your skin at all costs or it will cost you…..best case scenario- you will have crows feet and leathery skin way too early. Worst case scenario- skin cancer. Love the skin you’re in 🙂 It’s never too late. Get started now, let me show you how! (My personal SPF & makeup routine, step by step) 1. Apply SPF on clean skin. 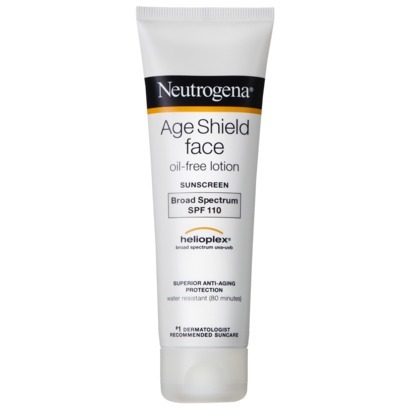 I use Neutrogena SPF 110. 2. Let it soak in for 5 minutes. I walk away, brush my teeth, pet the dog….whatevs. 3.Apply face makeup. My full makeup consists of BB Cream and Bare Minerals powder foundation, followed by highlight, contour, eye makeup, blush etc. 4. Once makeup is gorge and “done” apply SPF powder ON TOP of everything. Bare Minerals has a translucent powder called Mineral veil- it basically locks in your makeup and it almost creates an air brushed look to the skin. Why is this last step so unique? Mineral veil is available with SPF 25, so it is adding an extra layer of protection. This also allows you to reapply SPF throughout the day by dusting some powder on. Mineral veil comes in original for fair to medium skin tones and tinted for medium to dark skin tones. I have both and mix them for a gorgeous shade. There is No need to go and throw out your current makeup/foundation. Any makeup works as the FIRST and LAST steps include SPF. This has been working wonders for me and I hope it can help you too. Great post! I have been wanting to try bareminerals for a while now and I think I am definitely going to have to purchase the veil powder! Thanks! I highly recommend Bare Minerals and the veil. Thanks! yes the veil is the icing on the cake! The higher the better! Go for it.